Doesn’t that crack you up? It does me – because it sounds very snooty and fanciful – very professional if you will. I certainly don’t have any “professional” ideas when it comes to decorating but I definitely have ideas. When I bought my first home, a lot of the things I brought with me to my home were things I’d had for a lifetime: my bedroom from my teenage years, living room furniture courtesy of my parents, a desk from my college days….you get the drift, right? I also feel like I wasn’t 100% certain what I wanted out of “the look” of my own place, so I went with the things I had and worked from there. Well – very soon I will (finally) have my own place again. It’s just a one bedroom apartment space (that is yes…in the basement of my parent’s home…) but it will be MY space and let me tell you – I have got ideas this time. Oh boy do I have ideas. Please feel free to peruse those above images – I maybe should have crammed them together – but I didn’t. 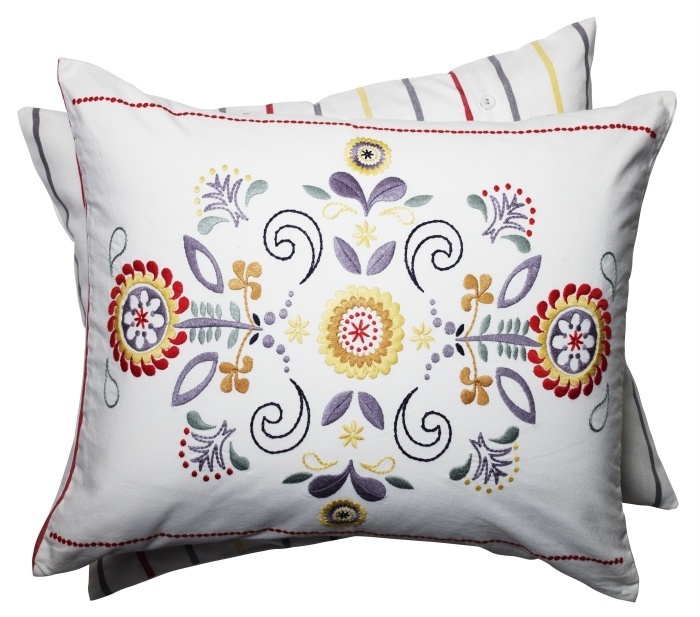 Eons ago I purchased the most wonderful pillow from Ikea (which I have put below) and it is literally what my entire open area living room/study/dining area has been patterned around. Talk about taking something and running with it…right? I also long ago found a gray couch at Ikea that I thought I loved, but I think I’ve moved on to the above pictured couch (in gray…not pale brown/tan). 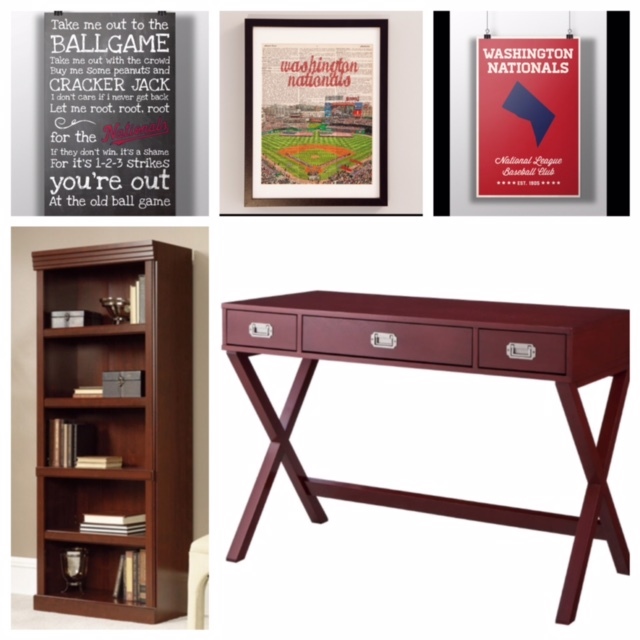 I’m thinking for my “study” area; the centerpiece will definitely be a red desk, the one that I really like is from Target and I plan to flank it with some dark wood bookshelves (which I already have). A couple Washington Nationals prints (as seen above) and some Ikea floating shelves to display it all on and that little area will be complete! The living room portion of the house will definitely be focused on around a really lovely gray couch and a dark wood coffee table. I’d like to do some decor that focuses on travel – I love to go and see and do – and I want to showcase that. I absolutely love the idea in the bottom left of the picture: vintage travel posters! I actually have those very pictures and plan to center some type of gallery wall around a gigantic picture from my Christmas trip to London! 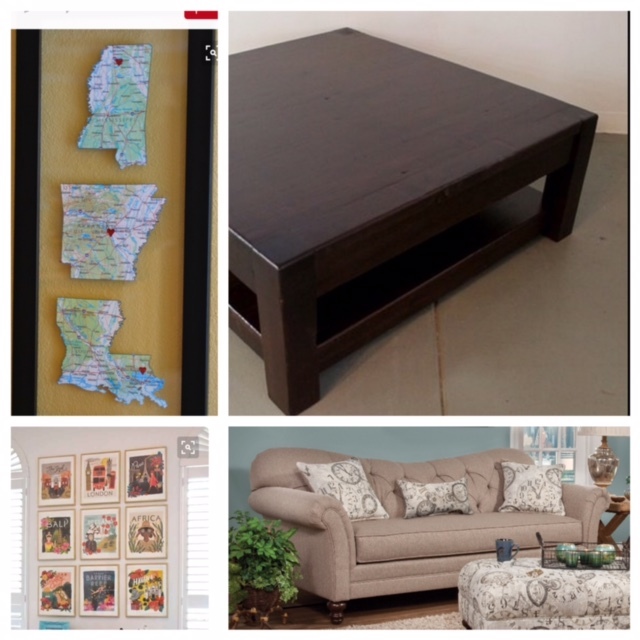 I also have some great travel prints from Ikea that I’ll hang somewhere… A little handmade artwork to showcase the states I’ve lived in…and of course, THE pillow on the couch…and it will be all set! My bedroom is pretty much a done deal – but I thought I’d share it anyway! I redid my bedroom about a year ago in shades of gray and buttery yellow and I love it! 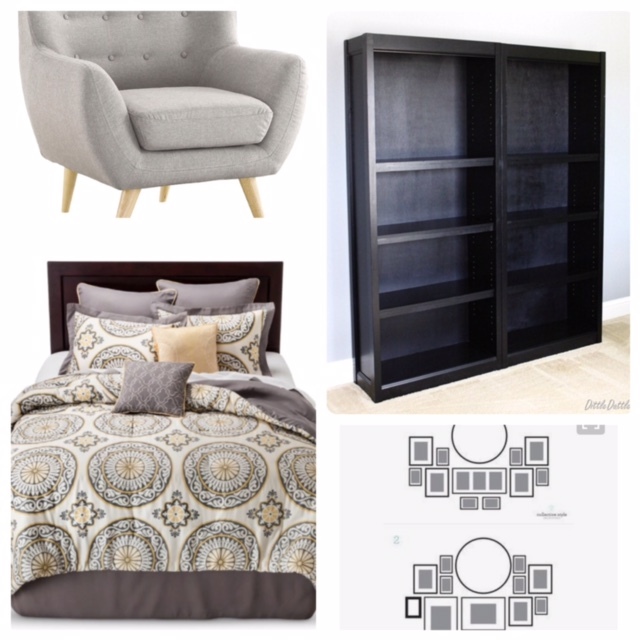 I bought a bed frame way back in the Spring on sale and I can’t wait to get it out and set up…and I also can’t wait to get my cute little gray chair (pictured below) and get it set up – it’s on it’s way now! I’ll be adding some black bookshelves (which I already have…but don’t currently have a place for…) and a gallery wall or two and everything there will be all set! The last little place…well that would be the bathroom! I chose tile colors a while back and they will be in the black/gray family and I know it’s going to look amazing! I decided a while back to use a lot of what I already have – I originally had a black/white/gray bathroom and I think I’m going to stick with those colors. However, I found a three pack canvas at Ikea a while back (man – I do love the Ikea) and the center canvas really inspired the bathroom idea below…the accent color is purple! I already have black, white and gray towel…so maybe just a small purple towel for accent? Those purple towels below are pretty bright…so we’ll see! 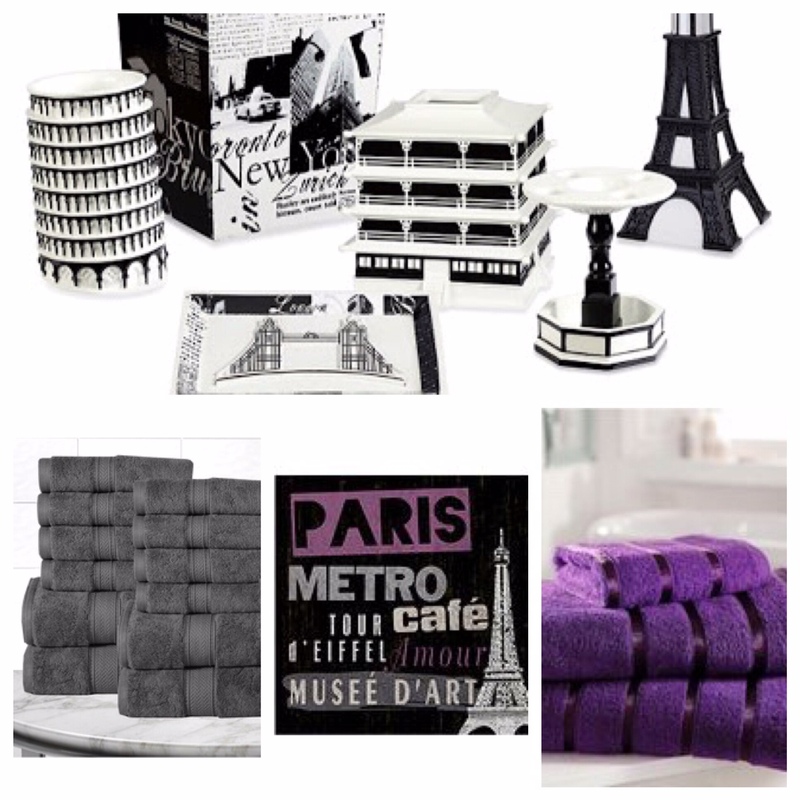 I love the world travel bathroom accents and the Paris picture is MY canvas! I can’t wait. So – I don’t know a whole lot about design aesthetic…but I know what I like…and I know what I’d like MY space to look like. Thankfully, I already have about 75% of what I need to make this happen, I’ve just got to get some more pieces here and there to make it work! I can’t wait to put everything together and finally have my own space again – and I can’t wait to make it look like I’ve imagined it in my head!